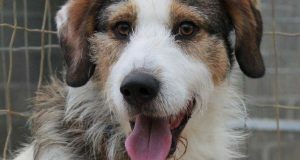 Home / Latest News / Its good to be nosy..
Its good to be nosy..
…..if you are a dog that is! A dog’s sense of smell is about 1,000 to 10,000,000 times more sensitive than a human’s (depending on the breed). A human has about 5 million scent glands, compared to a dog, who has anywhere from 125 million to 300 million (depending on the breed). Ever wonder why your dog’s nose is wet? The mucus on a dog’s nose actually helps it smell by capturing scent particles. When a dog’s nose is dry they may lick it to aid them in scent. A big part of understanding your dog is understanding its senses and accepting that they are indeed different than ours. Both humans and dogs have the same three senses: sight, hearing and smelling, however while most humans communicate by hearing, seeing, and then smelling, dogs primarily communicate by smelling, seeing and lastly hearing. 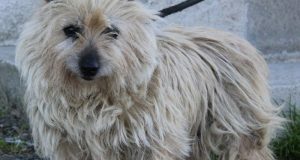 Dogs also have a universal sense which most humans do not have, where they can feel the energy (emotions) of the other beings around them. 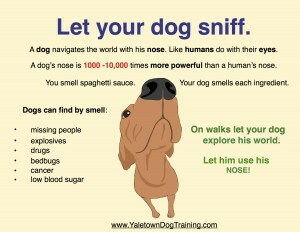 So try to give your dog time to smell and to use his nose. I know its tempting to say ‘come on get a move on’ but especially if your dog doesn’t have lots of off leash time when it can smell as much as it likes, then do try to be patient and and encourage him to be as nosy as possible! 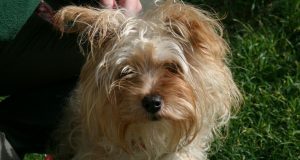 Previous: News of adoptions and fosters!